Day 2 in Casa McBardo. 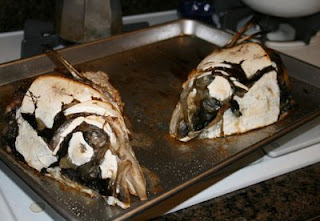 The fish head stew! I've been admonished to write down how this was prepared, and I must admit I take inspiration from Malaysian flavors. First of all, about the fish - larger fish are preferred, something like salmon is about the smallest I'd go. 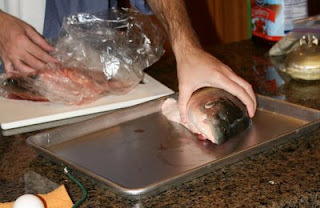 Be sure to ask your fish monger to remove the gills - more likely best accomplished by actually splitting the head. see, doesn't that look friendly? We salted both sides of the fish well, and fired up the broiler (though not without seriously considering using the grill instead). Oh, well, with the heat coming from above, we started broiling cut side up. Nice, a few charred parts. Perfect. 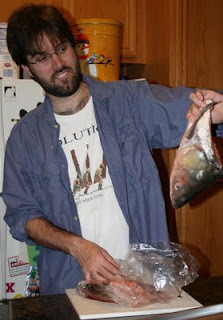 That was thrown whole into a large stock pot, and added enough water to come up to halfway to the fish. Then the aromatics: 3 sprigs of celery, roughly chopped, a knob of sliced ginger, about 8 cloves of garlic, roughly chopped, a good bit of dried lemongrass (I would have preferred fresh, but I can't be too choosy), about five cloves, a tablespoon of chili garlic paste, a bit of ground turmeric, cumin, and black pepper, a few dried shiitake mushrooms, a can of coconut milk, and some additional water until it is just about covered. We brought it up to a boil, and simmered for about 40 minutes. We adjusted for salt, and added some cider vinegar to balance the richness, and to bring out a bit of tang. At the end, we added a couple of fresh tomatoes. The resulting soup was a riot. 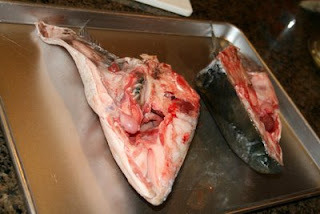 The fish flesh itself is toothsome when it is this close to the bone. 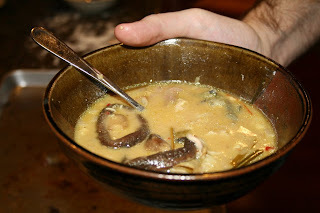 Certainly, we could have strained the soup (as the broth itself is redolent with flavor and unctuousness), but we opted to be rustic about it.